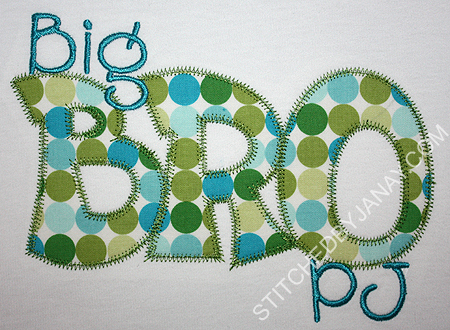 I love MCA Applique's sibling designs and have used them a couple of times, but I wanted to try the same concept with different fonts. 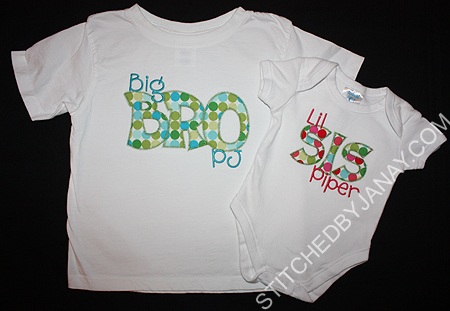 I used Embroidery Boutique's Cade Applique font for BRO and SIS. 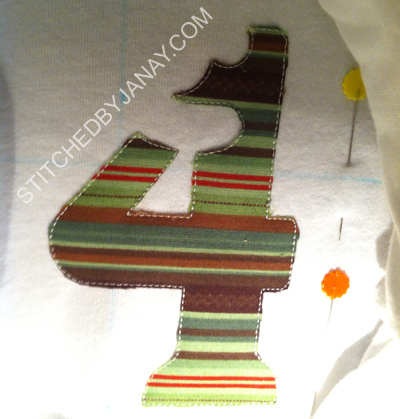 I love the zig zag version of this font, it's my go-to pick when creating applique words. I added the rest of the text with 8CP's Bobby font. I bought these Riley Blake dot prints specifically thinking about using them for sibling designs! 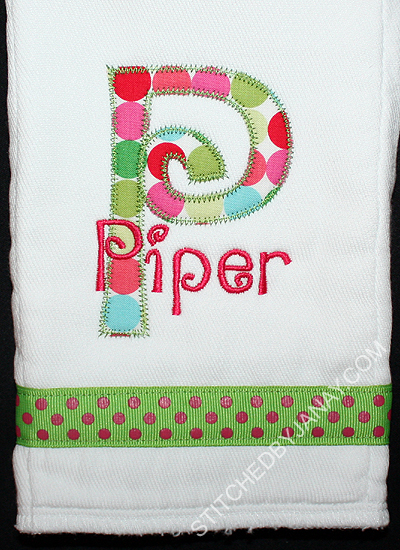 I looked through all of my applique fonts to find a pretty P, and picked EB's Swirly applique. 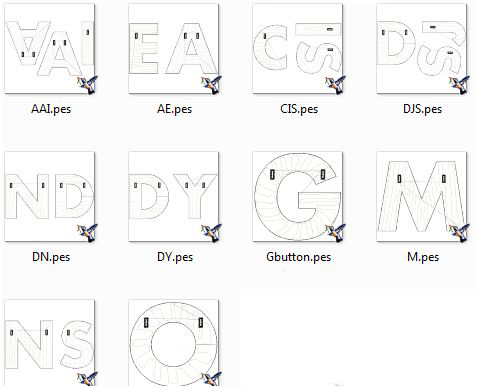 Then I started searching through the over 600 fonts I have on my 8CP CD, and was thrilled to discover that Harvey is based on the same font!! Woo-hoo! Way back at the beginning of the year when I bought some Monag dresses I got a red one in Annaliese's size, planning to use it this winter for Christmas. However she has gotten quite tall (I just had to buy size 10 jeans for her yesterday, where did my baby go??) and I knew the Monag dress would be too short without legging underneath. By the time I got around to buying some, I decided to shoot for a winter theme instead of Christmas. I happened upon these cute leggings at Gymboree. With the snowflakes and hearts it's perfect for wearing December-February (and beyond if it's cool enough)! My creative juices were running dry, so I used it as an opportunity to give 8CP's Jingle font a try. I plucked the snowflakes off one of LP's "Little Hoops" designs and the hearts off of LP's Simple Hearts on a Clothesline design to scatter around as a frame. 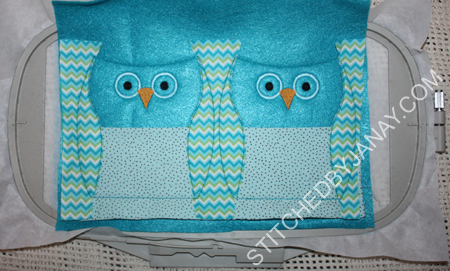 IF I had waited a few weeks longer, I would have used this new design from Original Stitches, which would have been PERFECT! I may just have to find a shirt to match these leggings and give it a go! 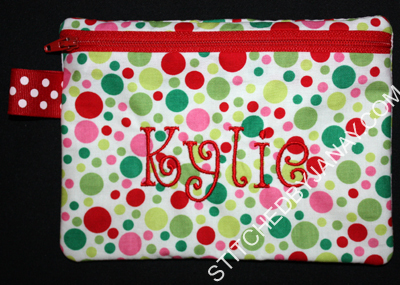 In the spring Sue asked me to make a name banner for her newest granddaughter, and shortly after asked if I could make one for each of her other granddaughters for Christmas gifts. She requested the color schemes and (months later) I got to work! 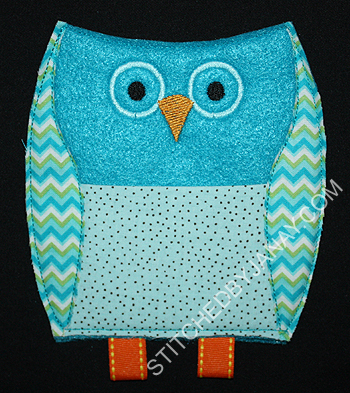 To save myself some time at the embroidery machine, I spent some time with my software at the beginning. 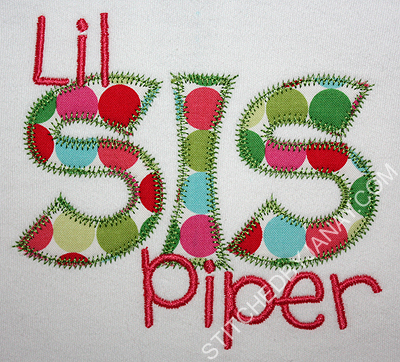 I made a list of what letters I needed in each fabric and then merged together letters in my 6x10 hoop. Often I could get 2 or 3 letters together. Instead of 23 separate hoopings with my 5x7 hoop, I completed all the letters in 12 hoopings. 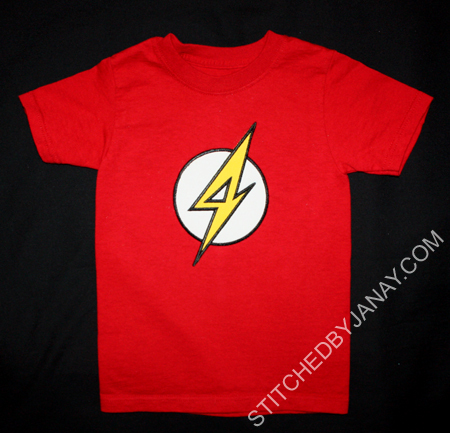 This saved time as well as fabric and stabilizer. Much more efficient! 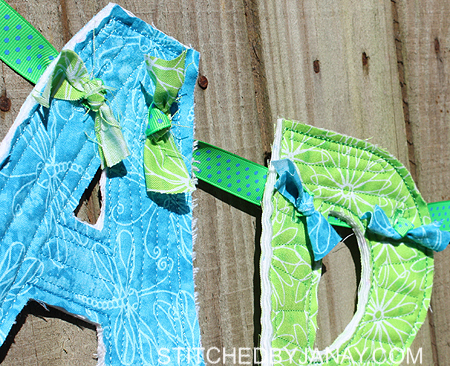 In my past name banners I have used short strips of fabric/muslin to tie letters together. This time I did a different technique. 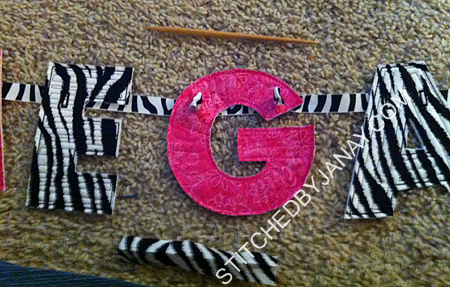 I spread out one long piece of ribbon and laid the letters on top. Using a little wooden stick I poked the ribbon through the button hole, tied a contrasting strip of fabric to the ribbon, and tugged it flush with the letter again. I like the look of the extra pop of color! 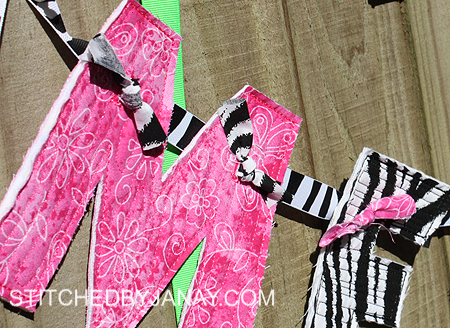 Having a piece of ribbon run across the back of letters like M and N also kept them from stretching and hanging goofy. Several weeks ago I shared my monogrammed sweatshirt, and while I had lofty intentions of monogramming all my blank shirts, it hasn't happened... YET. 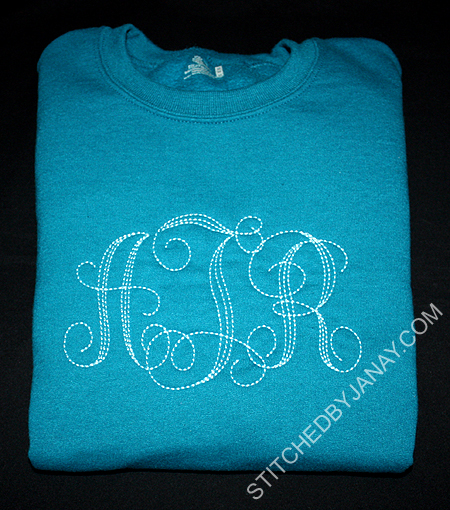 But I did manage to monogram a sweatshirt for Amy, and decided to put Jolson's Interlocking Floss Stitch Monogram to use. I like the look of this font, and it comes in several sizes. A quick word of caution, the way this is digitized there are several jumps within each letter. I'm not exactly sure why, IMHO they could have been minimized. 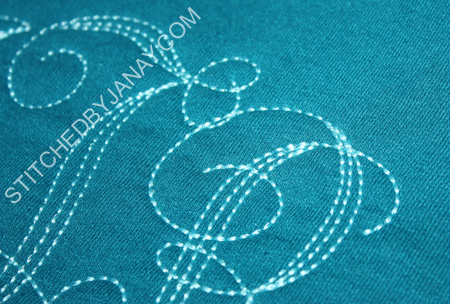 So if you are like me and don't have a machine that trims every jump within a color, keep an eye on it as it stitches. 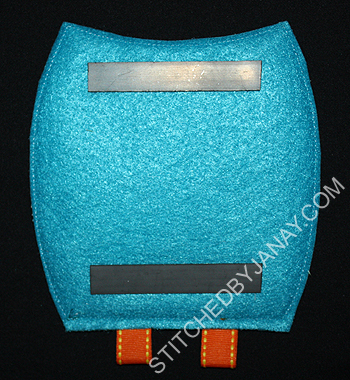 This won't keep me from using it again though, I really like the hand stitched look! I made these two for sweet little girls that have been my guinea pigs and gift recipients for over five years... it's getting hard to come up with new ideas. Ha! I used 8CP's Golden to add their names. Such a great font for girls! 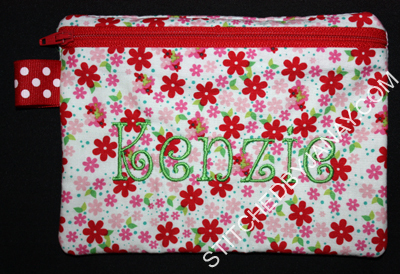 I also made a zipper tote for one of Annaliese's school buddies. I did hers first, and it was because of the sparkly stars on this fabric that I got the notion to skip the quilting lines. 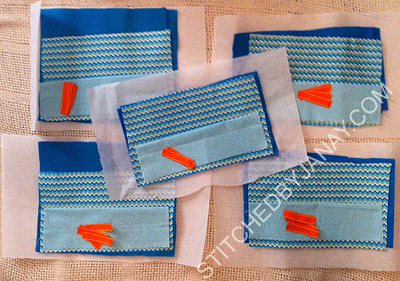 BUT for whatever reason I didn't think to secure the fabric that well, and WHOA did I get some puckers. Oh well, my daughter loved it and insisted on giving it anyway. Which was good, I didn't have time nor another zipper that color. :) I used 8CP's Pixie Dust to add her name. Remember, puckers are user error, not design or font issues!! 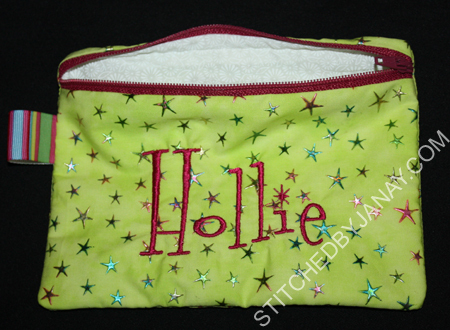 This zipper matched some of the shiny star bursts, so I picked that color for the thread. 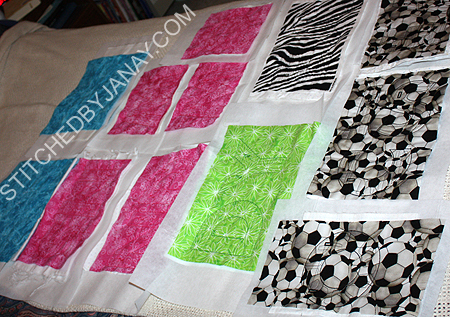 But I didn't have any fabric that color in my stash, so white it was for the lining. I purchased a new design set over the weekend, one I have been eying for a bit, but had to get through some holiday related projects before jumping on the split monogram bandwagon! When it went on sale, I was so excited to grab it and put it to use right away... after all, I couldn't arrive to Christmas Eve dinner empty handed, right? 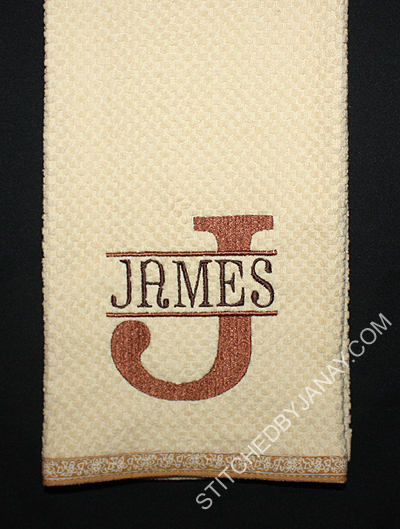 The Split Alphabet set is from Savvy Stitches Applique, and I used 8CP's Kelsi to add "James". I don't know if this font would work for every names since it is a mixed case font, but I was able to remove the dot on top of the J and use the caps version of all the other letters for this particular name and really liked it! 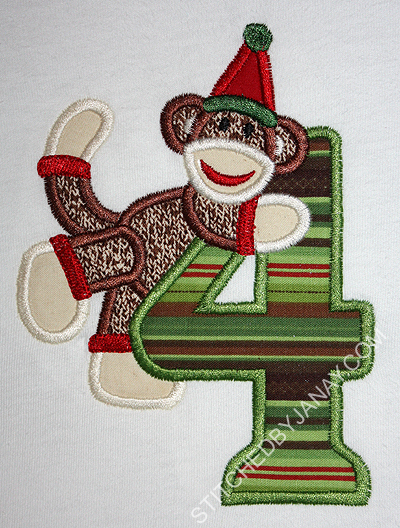 I scaled back my applique work a lot this last fall and didn't make very many Christmas shirts at all. 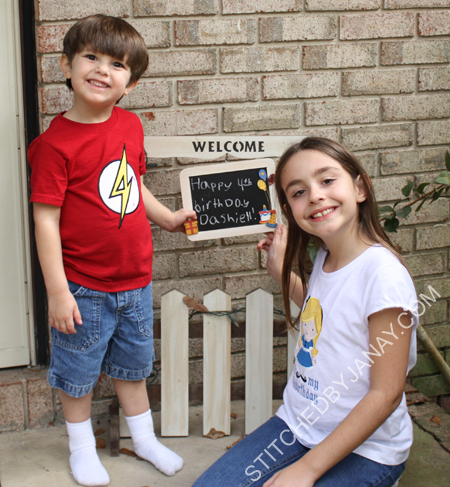 Since the shirts I made my kids last year still fit (woo-hoo!) 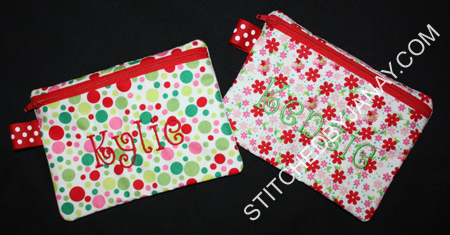 I used my new nieces as guinea pigs when testing these cute designs for a couple digitizers. 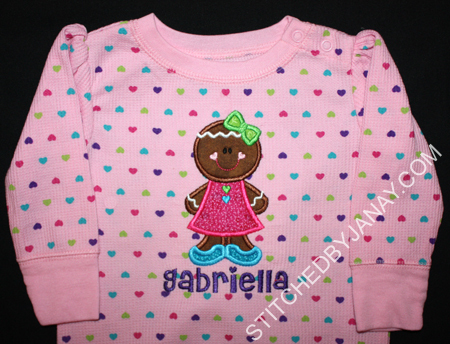 I didn't have any long sleeved onesies in Gabriella's size in my stash, and couldn't find a white one in stores, so I grabbed this thermal one, not exactly sure what I was going to put on it. Imagine my delight when this design appeared in my inbox!! I immediately knew the onesie was a perfect canvas! 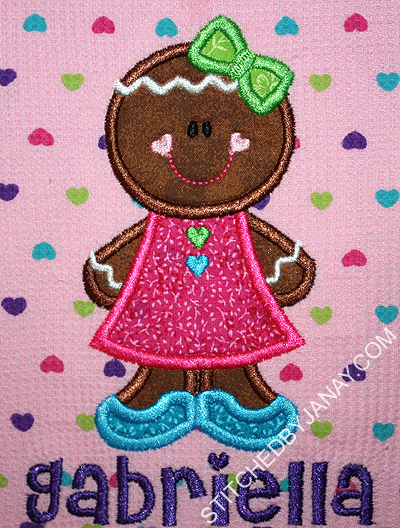 The Gingerbread Girl design is from Lynnie Pinnie and I used Mandi from 8CP to add her name. Perfection! 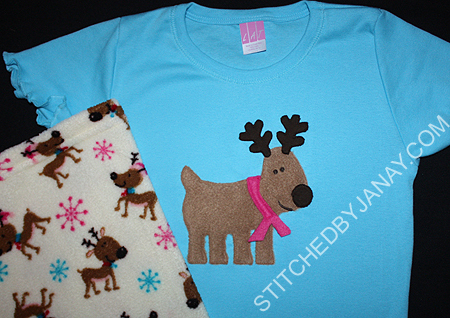 When I had the opportunity to test this sweet reindeer, I thought it would look so cute on a onesie! 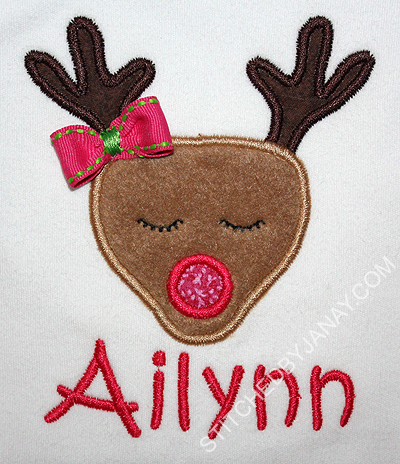 The Resting Reindeer is from East Coast Applique and I used Kristen from 8CP to add her name. Now for the bow... the pink premade bow in my stash didn't match the bright pink I used for her nose and name. But I had a scrap (and I mean scrap!) of ribbon that was the perfect color. I searched for a scrap of green ribbon to tie the knot and didn't have anything quite right. So thread came to the rescue! 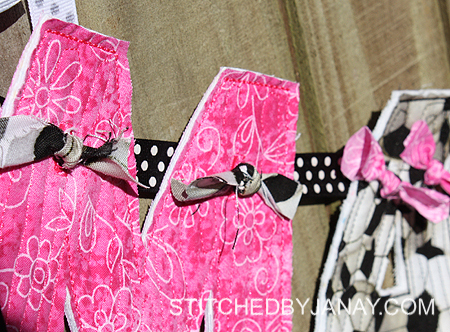 I used the button stitch on my machine (several times) to tack down the bow. I thought it turned out cute! Since Gabriella got a bonus item earlier in the fall, It was Ailynn's turn to get a little something extra. :) I have had this sweet double ruffle tiny tee in my stash for a long time and finally had the perfect design and recipient for it! 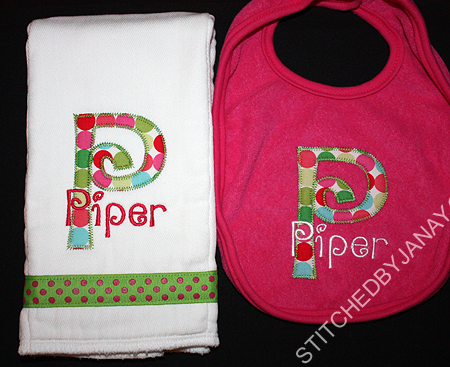 I used LP's Crafty Heart Applique Frame and added her initial with 8CP's Haily font. I love having over 600 fonts to choose from! 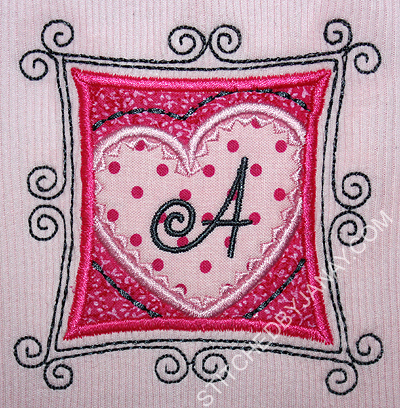 I was able to find an A that had a swirl to match the frame and was shaped just right to fit in the asymmetrical heart! Those who have been reading my blog for a while know that I was a teacher before having kids, and therefore have a heart for all of those who work at a school. 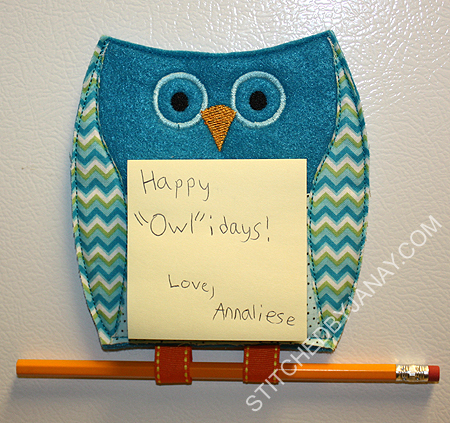 We like to give a small token of our gratitude to the men and women who teach Annaliese, whether it be all day in the classroom or for a little bit each week in special area. 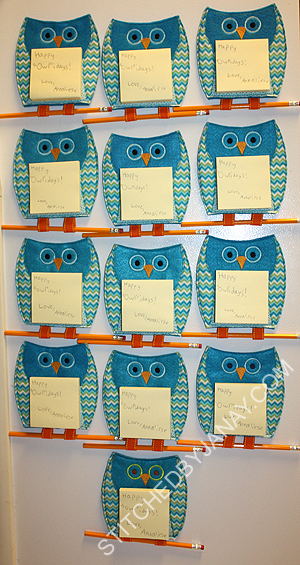 You probably also know that their school mascot is an owl, so it should come as no surprise that when Embroidery Garden shared this owl post it note holder as a freebie in the yahoo group in November I knew immediately what we were going to give this year!! Now, did I jump on it and make them right away, or wait until the last possible minute? Sigh.... I guess it doesn't matter really, they would have been delivered on the last day of school either way! The directions call for one loop of ribbon to hold the pen, but I was inspired by another project (posted on the EG Facebook wall) that used 2 loops of ribbon -- looks like feet sitting on a branch! My goal was to find natural wood pencils, but I ran out of time to track those down. And the back, with two magnetic strips glued on. Man, that E6000 glue has a strong smell, my head ached the rest of the day!! Recent events make me mindful of how the responsibilities of educators extend far beyond just teaching academics. I find peace knowing that when we drop Annaliese off she is loved and cared for by professionals that keep her safe and happy while she learns. To all of you who have chosen a career in education -- THANK YOU!! May you have a restful holiday break. 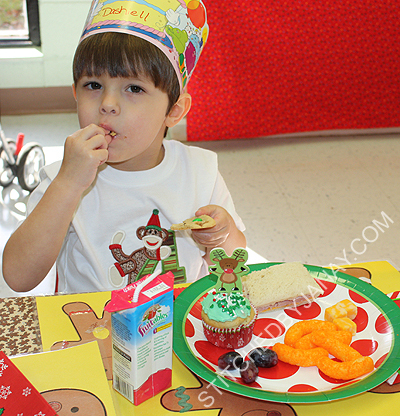 Yesterday was also Dashiell's last day of preschool before winter break, and hence a Christmas program and party. So I used red and green in the design to make it a 2-for-1 special! 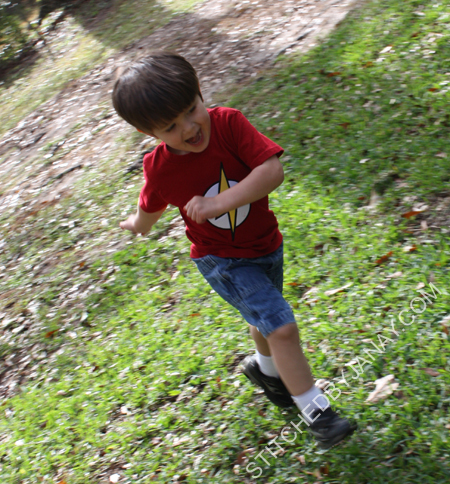 Dashiell picked the striped fabric out of four choices--this won because his favorite color is dark brown. Weird, right? I'm pleased with it, and it doesn't scream Christmas, so hopefully he will continue to wear it over the next few months. 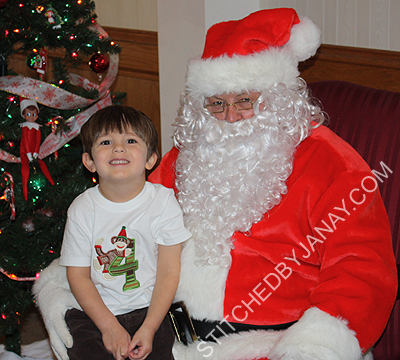 And Santa stopped by for a visit! What a special day! I love this!! Sometimes when you buy alphabet or number sets the complete letter is sewn down and the extra designs are slapped on top. Not so here!! And I'm thankful. 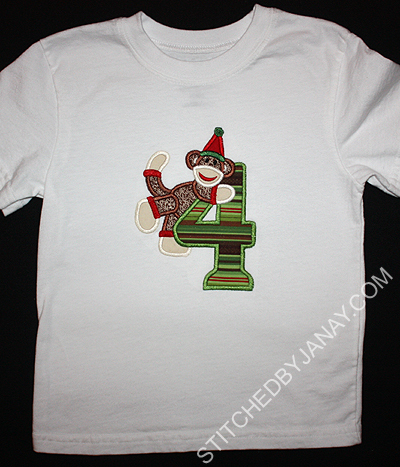 Otherwise there would be stripes showing through the monkey's hand instead of it being the crisp ivory color that it is. Thanks DBJJ for setting me up for success!! 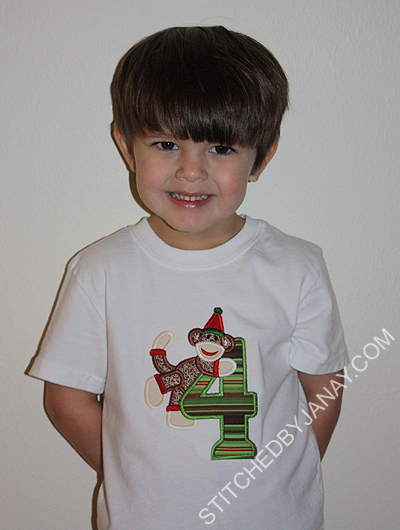 My boy will turn FOUR this week. I can't believe it! I enlisted the help of two wonderful people. First, my ubber creative husband, Carlin Trammel. 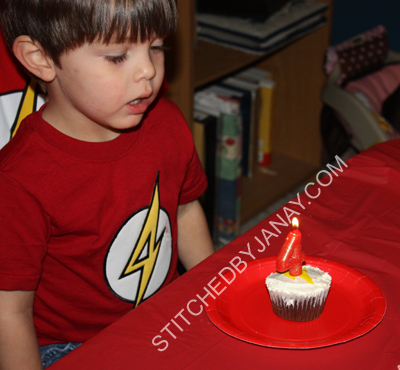 We wanted to continue the superhero-inspired design ideas we have used for Dashiell's birthdays in the past. Simply using the Fantastic Four logo was way too obvious. We needed something more unique and decided to keep it in the DC Comics family. 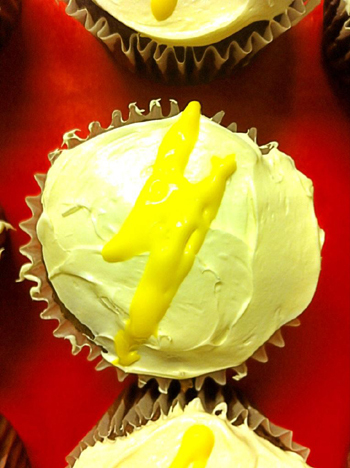 In 2010 we had Two-perman, 2011 brought us Boy Wonder, and this year let me introduce THE 4LASH! 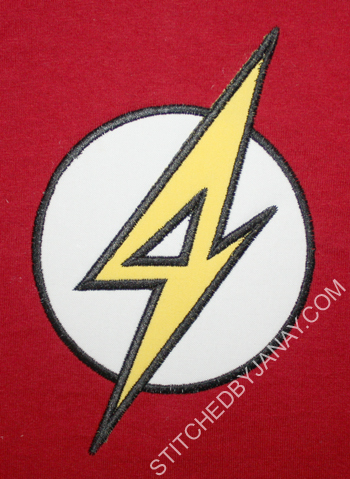 Carlin drew a Flash-inspired emblem, but made the bolt look like a 4. I love it!! I digitized the Two-perman logo, and it turned out fine. When I gave this one a go, my points were blunted and I just couldn't figure out how to make them look right. (Some points were blunted on Two-perman, but I guess I didn't care as much then as I do now.) I asked my friend Julie for tips, but instead she volunteered to do it for me. She whipped it out so fast! It's perfect! Thank you!! This truly is one of my favorite kinds of projects. 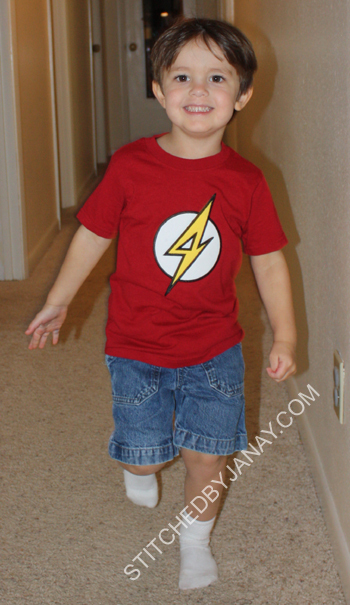 If you've read my blog for any length of time you know I am CHEAP!! :) Last year I grabbed these clearance pajama pants in a size up for Annaliese and stashed them away, promising to make her a coordinating shirt before winter. I completed it yesterday! It took me a while to decide what design to use. 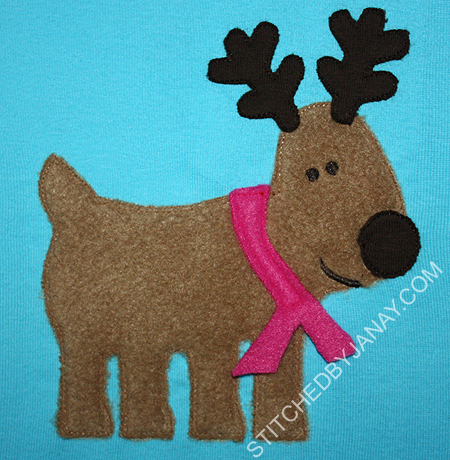 I did an extensive google image search on reindeer applique designs to find a good one to use. I stumbled upon one that was a close match to this print, but from a digitizer I wasn't familiar with. I briefly browsed the etsy shop and found some designs of team logos and licensed characters... and had to break the news to Annaliese that I would not be buying that reindeer design. It's my personal goal to not support digitizers that break copyright laws -- I'd much rather support those who follow the rules! So I continued my search. 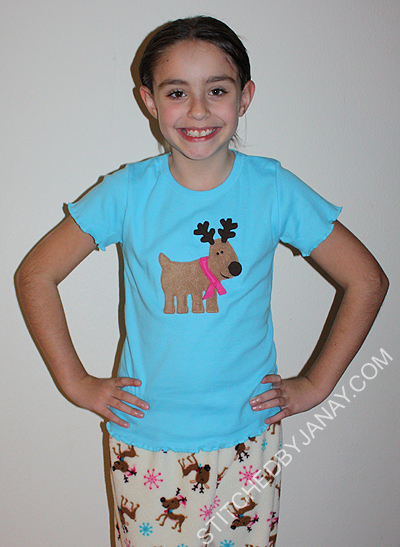 A few days later it dawned on me to search for "Rudolph" and boom, I found a cute design from a site I trust! 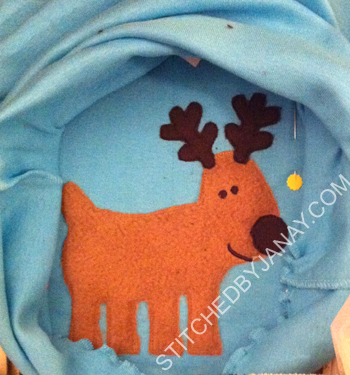 This is a modified version of Applique Cafe's Rudolph with lights design. It's missing a few things... obviously the lights, Annaliese wanted me to omit those since the reindeer on her pants don't have lights. Do you notice what else is missing?? We decided it looked good! 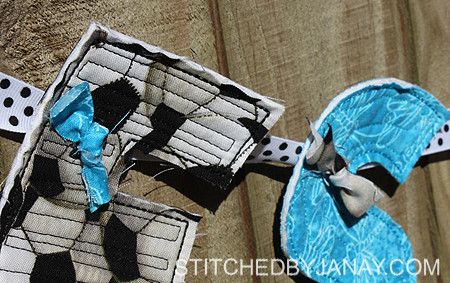 I removed it from the hoop and saved 20 minutes of stitch time! I literally got done trimming the stabilizer on the back as her bus drove down the street. So I carried it down the driveway with me and greeted her with it. She gave me the biggest hug! Experimenting with Box Font and Chevron!